"I'm all manual. Papers, folders, and binders." 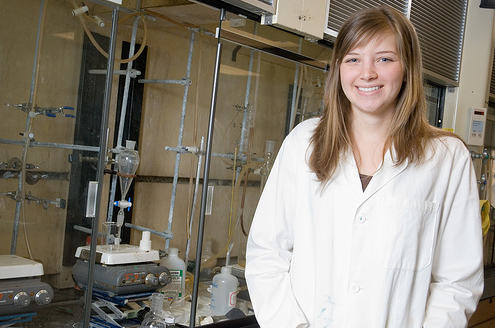 Stacey is a 4th year PhD student specializing in Microbiology at the University of Waterloo. She's been at UofW since completing her undergrad at the University of Calgary. She lives with her parents and younger sister in the suburbs about 50 minutes outside the city. Since she commutes she typically spends all day on campus, 8 - 5 Monday through Friday. She's glad to have VW bug with the way gas prices have gone up lately. She does most of the work on campus, in the lab and in her office, and almost never works at home. Stacey's home computer is a PC, which she only uses for checking email. She uses her iMac in her lab and occasionally uses the iBook in her office that her department gave her a few years ago. Even though it's a laptop, she finds it heavy to carry around and just leaves it in the office. Since the other TAs she works with use PCs, she is always concerned about compatibility when they share documents such as PowerPoint slides, Excel sheets with grades, and Word documents. She uses a highly paper-based file organization system. She prints out course materials and organizes them into binders in chronological order. Normally she'll print out the lecture notes for the upcoming lecture and just carry them to class in a "Today" folder (because it's lighter that way--she doesn't really need the whole binder). She takes notes on them and when she gets home, puts them in the binder for that course. If she hasn't had time to read the notes, she'll put the notes in the binder without punching holes, so they stick out. This is her flagging system, reminding herself to read it later. She also digitally organizes her files into folders on the desktop. She has a folder for the "old crap," where she dumps all the old folders and files. When she needs to find an old file, she uses the OS X Finder's "Search" capability. If she needs to take files home to her other computer, she just emails them to her Yahoo account. Stacey uses Blackboard as both a TA and a student but is not a huge fan. She's also used CCNet as a student. She only logs in when she gets an email notification with important announcements. Each of the departments she works with has their own LMS. As a TA supporting multiple departments, she finds this very cumbersome and would like one integrated LMS. She TA's for both her own department, Microbiology, as well as the Optometry department where she TAs a lab course. In this course her students print out the lab instructions (which have been uploaded by the coordinator managing the course) from their department's LMS. Unfortunately she doesn't have access to this LMS since she's not officially in the department. Though she's given paper versions of the instructions at the beginning of the semester, this causes problems sometimes -- she's walked into the lab before with different instructions than the students! She really thinks it would help if she could log into the students' LMS and see exactly what they see. She prepares forms which her students use to fill in lab results as well as her own quizzes for the lab course. Quizzes are specific to each experiment, and every TA has to prepare his/her own questions. Stacey also works part time at the office of Teaching Advancement where she coordinates the TA training program and trains other TAs. With other coordinators, she organizes (not for credit) workshops for TAs on how to teach students. The coordinators of the TA training program go to all the campus departments every fall to find out what subjects they'd like their TAs to be trained in. They then customize the training slides for each department. The training workshops vary in size, from 6 to 100, but typically they have about 40 TAs in a class. In these workshops, they cover topics such as how to give tutorial sessions, how to mark students work objectively, and how to deal with difficult students. Sometimes she writes essays based on her TA experience and posts them in a Blackboard site used by the TAs in the training program. This site helps them communicate and stay connected using tools such as a discussion board. Stacey tends to use email to communicate with students. She doesn't use Blackboard for this, however, because she'd have to type or copy and paste all her students' email addresses individually. Instead she uses her Yahoo! email because it allows her to easily create groups of contacts. She groups students by section and year and sends emails out to the group (which always also includes her boss, the coordinator). Submit grades for section's weekly quizzes - After she grades her quizzes, she puts them in a color-coded spreadsheet and emails it to the course coordinator, who then puts them into a separate grading system. All the TAs have their own version of this spreadsheet, and the color-coding tells them where to fill in their grades. Share course content with other TAs - Keep documents online to share with other TA trainers. Customize presentation for TA workshop and share with other TA trainers - In September, the TA trainers go to all departments to find out what they want their TAs to be trained in. Then the slides are customized for each department. The updated slide deck is posted online for easy access by all. Check for new posts on the course site after getting email notification - She only logs in when she gets an email notification that she has something to do. Important announcements also get emailed. Once she's logged in, she can see all new posts from the main page.